ePublishing Knowledge BaseePublishing Knowledge BaseePublishing Knowledge Base EditorialHow do I place an article or blog post in a featured position? This article will show you how to place an article or blog post in a featured position on a page, such as your homepage. The website will display the article that has been most recently tagged as "featured." You do not need to untag an article or blog post as featured in order to tag a newer article or blog post. Site placement, including designating featured content, is driven by the Taxonomy Manager. However, site placement is highly site-specific. Please contact your solutions manager if you have any questions. 1. Within your article, click on General under Edit, the default screen when you first open the article. 2. 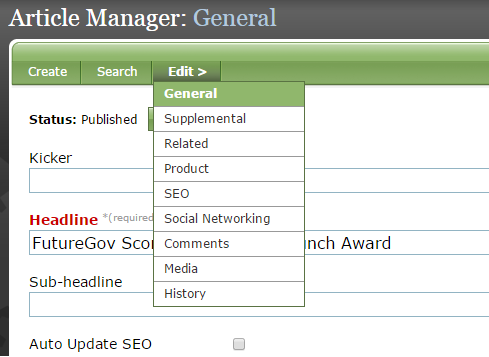 Under Site Placement, select the appropriate taxonomy based on where you want your article to be featured. Frequently, the taxonomy will be labeled "Featured ..."
Taxonomy is site-specific. Please contact your solutions manager with any questions. 3. If you make any changes, click Save at the bottom of the Article Manager. Prev: How do I unpublish an existing editorial content block? Next: How do I create or edit a publication?